Chelsea™ doll and her friends love to play outside! These fun play sets let imaginations play out the best backyard stories. Choose from a swing set with slide and a pool with slide. Both come with a Chelsea™ doll in a bright outfit and smaller accessories that add to the storytelling. The colorful swing set features two swings -- one for Chelsea™ doll and a smaller one for her adorable animal friend (also included). There’s also a slide with ladder, a sun decal and jungle gym details. The translucent blue pool makes waves with a sun-decorated umbrella, slide with ladder, inner tube and smoothie. Each Chelsea™ doll is ready for fun in the sun in a brightly colored fashion, removable fabric skirt and either matching shoes or sunglasses. Kids will love playing over and over again in Chelsea™ doll’s backyard because with Barbie®, anything is possible! Collect all of the Chelsea™ dolls and accessories for even more play possibilities. Includes Chelsea™ doll wearing a skirt and either shoes or sunglasses, plus large accessory and smaller themed pieces. Each sold separately, subject to availability. Colors and decorations may vary. Features: ? Play out the best backyard stories with outdoor-themed play sets that come with Chelsea™ doll, a large accessory and smaller themed pieces. ? Choose from a swing set with slide and a pool with slide. ? 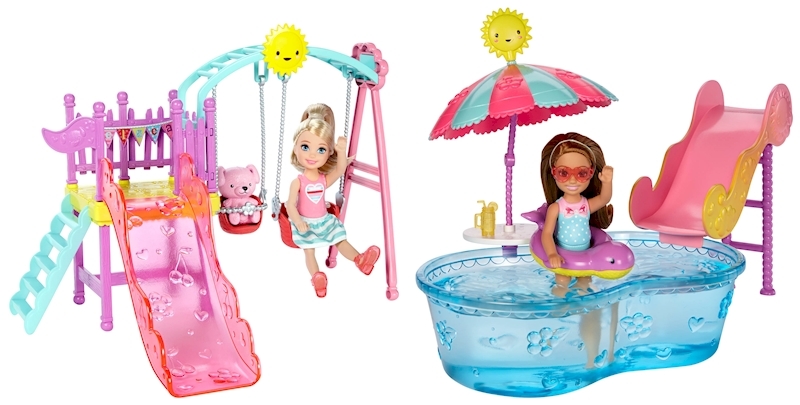 The colorful swing set features two swings -- one for Chelsea™ doll and a smaller one for her adorable animal friend (also included) along with a slide with ladder, a sun decal and jungle gym details. ? The translucent blue pool makes waves with a sun-decorated umbrella, slide with ladder, inner tube and smoothie. ? Each Chelsea™ doll is ready for fun in the sun wearing a brightly colored fashion, removable fabric skirt and either matching shoes or sunglasses. ? Collect all of the Chelsea™ dolls and accessories for even more storytelling fun (each sold separately, subject to availability).